Note: Please see correction below. At the International Association of Chiefs of Police Conference in October, presenters from the Orlando Police Department issued a stern warning for fellow local law enforcement officials eager to start a small unmanned aerial systems (sUAS or drones) program. That is excellent advice for police departments, but sheriffs in the San Francisco Bay Area have chosen not to follow it. 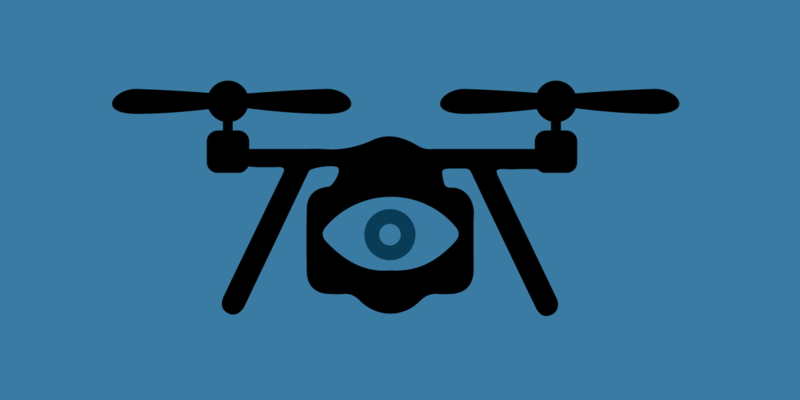 Records obtained by EFF and the Center for Human Rights and Privacy answer some questions, and raise many more about when, how, and if these agencies should deploy drones at peaceful protests. The same goes for drone deployment at mostly peaceful protests that are interrupted by a small portion of the participants engaging in civil disobedience, violence, or property damage. Correction: This section has been edited to reflect that all of the Alameda County reports occurred in 2017. We regret the error and oversight. On the final day at the same IACP conference, where Orlando Police spoke about drone best practices, the Anti-Defamation League hosted a panel titled “Handling Extremist Events: Balancing Freedom of Speech, Peaceful Assembly, and Public Safety.” It focused largely on clashes between protesters and counterprotesters, such as events where alt-right and nationalist demonstrators have faced off with Antifa-affiliated groups. A police chief in the audience asked the panelists whether they had used drones to surveil these protests. Assistant Chief Jeffery Carroll, who heads the Homeland Security Bureau in Washington, D.C’s Metropolitan Police Department, said no, because the jurisdiction is a "No Drone Zone." Richmond Police Chief Alfred Durham from Virginia explained that in his state, drones generally require a warrant, except in exigent circumstances, such as an active shooter. Instead, the agencies generally relied on helicopters. UC Berkeley’s Chief of Police Margo Bennett described a very different approach. She publicly confirmed, for the first time to our knowledge, that the Alameda County Sheriff’s Office had deployed drones at protests. Chief Bennett disclosed that she requested air support ahead of protests against campus speakers, such as Ben Shapiro and Milo Yiannopoulos. According to the county’s policy, the sheriff is allowed to put them up in the air once they have reason to believe a felony—such as physical violence or property destruction—is occurring. With that tip, we compared the dates of a series of high profile protests against a bare-bones Alameda County Sheriff drone mission log obtained earlier by the Center for Human Rights and Privacy through a California Public Records Act request. Then we used that information to request the formal “Mission Report Forms” from those protests. Prior to the IACP conference, the Alameda County Sheriff had refused to hand over these mission reports, claiming that as investigative records they were exempt. This time, they turned over the documents for 10 separate mission logs related to six days of protests, although on some days the drones never left the ground. In addition to UC Berkeley, the Alameda County Sheriff also responded to air support requests from the City of Berkeley Police Chief. Read the mission reports and associated emails. August 27, 2017 - "Say No To Marxism"/"Rally Against Hate"
At the request of the Berkeley Police Department, two separate Alameda County drone teams were on hand. They flew DJI Phantom 4 drones over the zone after receiving reports of alleged assault. The UC Berkeley Police Chief requested drone surveillance for the planned protest against the speaker. While Alameda County deputies authorized DJI Inspire and DJI Phantom 4 drones, no flights were conducted. As was the case with the Shapiro event, the UC Berkeley Police Chief requested drone surveillance, and the Alameda County Sheriff logged missions for the DJI Inspire and DJI Phantom 4 drones. On the first two days, the drones never left the ground. On September 26, the drones flew after violence allegedly occurred. On September 27, the drones were on standby, but did not deploy. By Any Means Necessary (BAMN) and ANTIFA members were expected to take part in the protest and these groups are notoriously violent and encourage civil disobedience, property destruction and physical violence. BAMN states the following on their web page, “BAMN will employ whatever means are necessary to oppose and defeat these attacks on the democratic and egalitarian aspirations and struggles of our people.” ANTIFA is described as a movement that engages in varied protest tactics, which included property damage and physical violence. At the IACP conference, UC Berkeley Police Chief Bennett explained that the drones were most helpful in “situational awareness.” She also said the department later confronted the protest organizers with the captured footage. But Antifa was able to get into their leaving process, and me being able to see that from the drone perspective, seeing it from the air allowed me to have really candid conversations [over] the following days with some accountability. ‘You cannot have these people with what you’re doing, delegitimizing yourselves and creating major issues for our community.’ It was a perspective we only got from the freedom of being in the air. Chief Bennett did not say whether she had similar conversations with conservative groups whose members were also involved in altercations. While police are increasingly challenged with providing safe space for dissent, flying drones over protests threatens the First Amendment rights of peaceful protesters, even if a small minority may allegedly engage in criminal activities. The Alameda County Sheriff’s policy for the operation of drones offers no guidance on how to balance freedom of expression and assembly against situational awareness and evidence gathering. In fact, the procedures do not address protests at all. Instead, deputies seem to rely on parts of the policy that say missions are authorized if there is probable cause it will capture footage relevant to a felony. While probable cause is a better requirement than no standard at all, it is a significantly lower threshold than the warrant requirements in states like Florida, Virginia, and North Dakota. Also, the policy encompasses an extremely broad variety of offenses, but in our view, police should only be allowed to aim drones at protests when the most serious crimes are suspected. Following each drone mission, deputies are supposed to review and evaluate the evidentiary value of the footage, then purge footage of “identifiable individuals” unless there is reasonable suspicion that a crime occurred. The Alameda County Sheriff refused to release records reflecting the evaluations conducted for protest footage, claiming they were exempt as investigative records. We also requested a copy of the annual audit of the drone program required by the general orders. The sheriff’s response: it does not have “any audits pertaining to our sUAS program.” It is alarming that the sheriff is not keeping a close eye on this intrusive program. The Alameda County Sheriff has spent more than $120,000 on six drones, according to documents obtained by the Center for Human Rights and Privacy. These costs include more than $90,000 on two drones that are rarely deployed. On June 30, researchers for the Center for Human Rights and Privacy witnessed first hand a drone monitoring peaceful immigrant rights protests outside the Contra Costa County Sheriff’s West County Detention Facility in Richmond, California. This jail houses undocumented immigrants through a deal with ICE (Sheriff David Livingston announced on July 10, 2018, that he would terminate the ICE contract). A subsequent public records request of mission logs confirmed that the sheriff authorized drone flights for rallies on June 26 and June 30, 2018, at the detention facility. The fact that the drone was monitoring First Amendment activities was not documented in the log, although it was noted that the drones were used for "facility safety and security." The use of a DJI drone at the June 30 Abolish ICE protest was previously reported by Darwin BondGraham of the East Bay Express. He noted that an internal ICE memo released in 2017 claimed with “moderate confidence“ that the drone manufacturer was “providing U.S. critical infrastructure and law enforcement data to the Chinese government.” The company disputed the claim. The U.S. Army grounded its DJI drones in 2017 over security vulnerability concerns. Contra Costa County operates three of these drones, purchased at a cost of more than $19,000. The Center for Human Rights and Privacy filed a public records request for photos and videos captured by the drones, but the agency rejected the request, citing the investigative record exemption under the California Public Records Act. Contra Costa County’s policy is almost identical to Alameda County’s, particularly in failing to address the privacy and free speech implications of flying drones over demonstrations and political gatherings. This police use of drones to spy on First Amendment activity is just one reason why many community members oppose drone programs. This is why city councils and the public as a whole, and not law enforcement officials, must have the ultimate power to decide whether or not police agencies acquire drones. And if city councils approve drone programs, they must insist on robust policies to limit how police use drones. This year, cities in San Francisco's East Bay area have taken up policies to ensure that law enforcement doesn’t acquire surveillance technology without such a public process. In Berkeley and Oakland, city councils passed a measure sometimes referred to as “Community Control Over Police Surveillance” (CCOPS) ordinances or “Surveillance Equipment Regulation Ordinances” (SERO). In Silicon Valley, Santa Clara County adopted such a law, too, which applies to that county’s sheriff. It’s time for East Bay county governments to follow suit. Sheriffs should not be allowed to fly drones over protests—or at all—without an accountable process approved by the communities they serve. Otherwise, like the Orlando Police Department cautioned, these programs ought to be destroyed. This report was co-authored with Mike Katz-Lacabe, director of research for the Center for Human Rights and Privacy.